After a full morning of visiting some of the most beautiful and complex structural projects, we hit the road southeast to add a little spark to our trip. After a two hour drive, we reach Richmond, KY and see a familiar GLCM face peering out the Bechtel-Parsons office – Eliza Gawenda. We enter the office for an initial introduction where we are greeted by Rick Goetz ad Mark Wyork. They introduce us first to the overall hierarchy of leadership within the project. Bechtel and Parsons were hired as a joint venture for the United States Military. 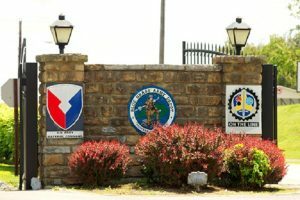 The overall objective of the team is to accomplish to safely and efficiently dispose of the remaining chemical weapons stockpile stored at the Bluegrass Weapons Depot. 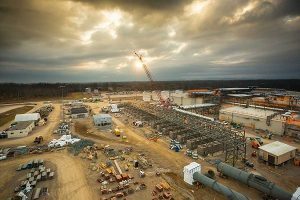 Bechtel was assigned as main contractor and project manager of the site while Parsons was set as the engineering designer and manager of the facility and environmental control systems. Underneath the chain of command, AECOM, Battelle, GP Strategies, and General Atomics were hired to design and systematize the plant for its specific needs. Most of these companies have had several years of experience working for the Department of Defense Assembled Chemical Weapons Alternatives Program, especially in Pueblo and Newport Chemical Agent Destruction Plants. The Parsons Governmental Services Sector has even in the past had the opportunity to work for a facility in Siberia, Russia. The weapons that will be decommissioned include rockets and projectiles filled with Sarin, VX, and mustard gas – nerve and blistering agents. The 523 tons of weaponry remains as the final 3% of the remaining chemical stockpile initially stored in the 1940s and 1960s. The initiative for the decommissioning of these weapons has been pushed since the 1997 Chemical Weapons Convention, where all countries (excluding Israel, Egypt, North Kora, and South Sudan) agreed to outlaw the production, stockpiling, and use of chemical weapons. The United States hopes to finally decommission the remainder of its stockpile by 2023. Initially, our method of destruction has been reverted towards incineration but with advancing technology and practice, the Bluegrass Weapons Depot decided to revert to using reverse assembly and neutralization to dispose of the stockpile. 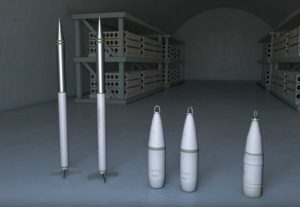 Initially, the outside shell of the projectiles is cut off and the chemical agent is drained from the war head. The chemical agent is neutralized until all that remains is water and saline. This final product is pumped into the ground into a well. The remaining metals from the projectiles undergo a heat treatment until all of the organics are completely destroyed. Afterwards, the metals are sent for processing and recycling. Our presenter reassured us the confidence level of the design and the exceedingly conservative processes installed at the plant. Initial construction and prep work began in 2006. As plans were finalized, ground was broken in 2010 and construction was completed 5 years afterwards. Before the decommissioning phase, the plant must still undergo a systemization and pilot testing program to ensure that the designed equipment follows specifications and plans, and that the manned staff understands their duties and procedures. Finally, it will take four years for the weapons to be safely decommissioned until its estimated completion year of 2023. After the process is complete, the plant will be deconstructed for it will have no further use. The entire life cycle of the project is estimated to cost about $5 billion, with $1.25 billion covering only construction costs. 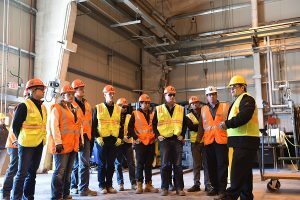 The total project hired 868 employees with 25.2% of workers from the local community.After our introduction, we were given a secure tour of the site around the plant’s perimeter and even within the main control room. With duct work and electrical conduit running everywhere, it as a pure spectacle of beauty and engineering complexity at work. The Bluegrass Weapons Depot was a truly unique experience that most construction managers will only come across once in a lifetime. We were truly thankful to be given a personal tour of the site and learn about the challenges and commitments towards designing an industrial facility such high risk in nature.